1. A player’s training and education takes place between the ages of 12 and 23. Training Compensation shall be payable, as a general rule, up to the age of 23 for training incurred up to the age of 21, unless it is evident that a player has already terminated his training period before the age of 21. In the latter case, Training Compensation shall be payable until the end of the Season in which the player reaches the age of 23, but the calculation of the amount payable shall be based on the years between 12 and the age when it is established that the player actually completed his training. 2. The obligation to pay Training Compensation is without prejudice to any obligation to pay compensation for breach of contract. 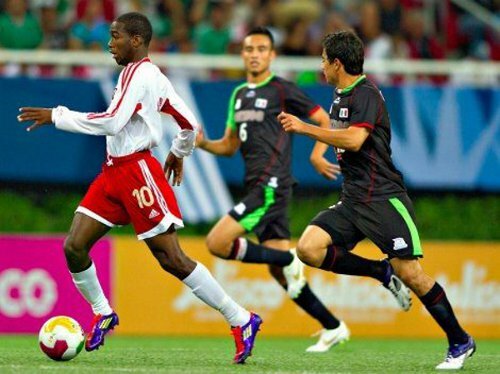 Photo: Trinidad and Tobago midfielder Kevin Molino (far left) leads Mexican opponents on a merry chase during 2012 Olympic qualifying action. The Regulations provide for the principle that between the ages of 12 and 23, a player is in his sporting education and that during this timeframe, compensation for his training is payable. Clubs that invest in the training of a player are entitled to a financial reward for the sporting education that the player received up to the age of 21, unless it is evident that the player terminated his training period before this age, in which case, compensation is limited to the period between 12 and when the player’s training effectively terminated. If a player who is younger than 23 breaches his employment contract without just cause, besides compensation for contractual breach for which the player and the new club are jointly liable, the new club has to pay training compensation to the former club. At present, Garcia is at the centre of a transfer tug of war between Central FC and his new Dutch agent Humphry Nijman. iii) if a Professional reacquires Amateur status on being transferred. Photo: Trinidad and Tobago midfielder Khaleem Hyland (left) holds off former England striker Dean Ashton during an international friendly on 4 May 2008 in Port of Spain. Training compensation is payable before the end of the season of the player’s 23rd birthday, when the player signs his first employment contract, i.e. when the player is registered for the first time as a professional, or when he transfers as a professional to a club affiliated to another association while maintaining the same status. Training compensation is on the other hand not due whenever the former club has breached a contract with the player without just cause. A club that has terminated a contract with a player without being entitled to do so shall not be rewarded for this attitude. Furthermore, no training compensation is due when the player transfers to a category 4 club, i.e. a club on the lowest level in the categorisation ladder of clubs with respect to the training compensation as the majority are purely amateur clubs. Finally, no training compensation is due if the player reacquires amateur status when he is transferred to a new club. 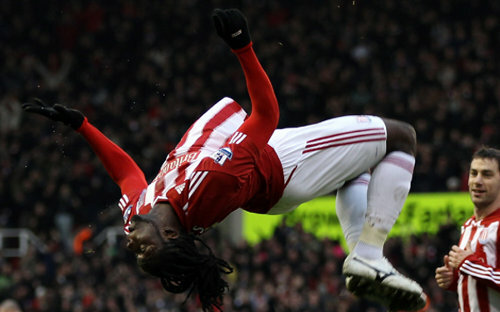 W Connection were heads over heels about Jones’ progress due to a sell-on clause in his first contract. 1. When a player is registering as a Professional for the first time, the club for which the player is being registered is responsible for paying Training Compensation within 30 days of registration to every club for which the player was registered (in accordance with the players’ career history as provided for in the player passport) and that has contributed to his training starting from the Season in which he had his 12th birthday. The amount payable is calculated on a pro rata basis according to the period of training that the player spent with each club. In the case of subsequent transfers of the Professional, Training Compensation will only be owed to his Former Club for the time he was effectively trained by that club. 2. In both of the above cases, the deadline for payment of Training Compensation is 30 days following the registration of the Professional with the New Association. 3. 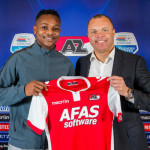 If a link between the Professional and any of the clubs that trained him cannot be established, or if those clubs do not make themselves known within 18 months of the player’s first registration as a Professional, the Training Compensation shall be paid to the Association(s) of the country (or countries) where the Professional was trained. This compensation shall be earmarked for youth football development programmes in the Association(s) in question. Seecharan hopes to move to Europe as a free agent. But that does not mean there are no development fees due to his former clubs. Training compensation should benefit all clubs that have contributed to the training of a young player. The regulations state that training compensation shall be distributed on a pro-rata basis according to the years of training received by the player. Training compensation is due for the first time when a player signs his first employment contract and thus registers as a professional. All the clubs that have contributed to the training of the player as from the age of 12 are entitled to training compensation for the timeframe that the player was effectively registered with them. For every subsequent transfer of the professional player until the end of the season of the player’s 23rd birthday, only the last club for which the player was registered is entitled to training compensation for the period that the player was effectively registered for this club. Training compensation is payable 30 days after the registration of a player for the new club. The new club must calculate the training compensation and the way in which it should be distributed to the clubs where the player previously played. No training compensation is due when a player over 23 years of age changes club. If the career of a player cannot be traced back to the age of 12, the amount for any “missing years” will be distributed to the association of the country where the player was registered and shall be used for youth development programmes. The association is entitled to claim training compensation as soon as 18 months have elapsed since the registration of the player for the new club. The association has six months to do so, as the right will lapse 2 years after the registration. However, if the association has irrefutable evidence that one of its affiliated clubs, which is entitled to training compensation, no longer exists, then training compensation should be paid immediately to the association and not only after 18 months. If an association claims training compensation and an entitled club then appears, the claim of the association will obviously lose all effect. 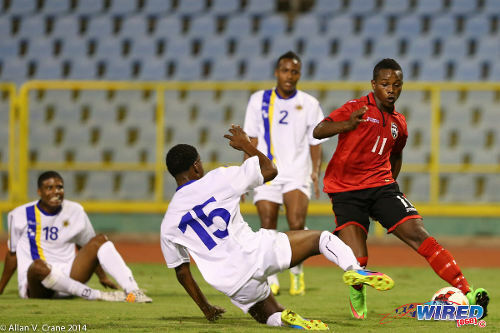 If no local club can claim developmental fees for Woo Ling, the TTFA can claim the money and reinvest it into youth development. In order to calculate the compensation due for training and education costs, Associations are instructed to divide their clubs into a maximum of four categories in accordance with the clubs’ financial investment in training players. The training costs are set for each category and correspond to the amount needed to train one player for one year multiplied by an average “player factor”, which is the ratio between the number of players who need to be trained to produce one professional player. The training costs, which are established on a confederation basis for each category of club, as well as the categorisation of clubs for each Association, are published on the FIFA website (www.FIFA.com). They will be updated at the end of every calendar year. In order to facilitate the calculation of the amount of training compensation due, the training costs are not calculated for each individual club. Instead, all clubs are classified into categories and the training costs are determined at confederation level for each category. FIFA has allocated all associations to categories and has established on a confederation basis the training costs for the different categories. This yearly amount takes into account the so-called “player factor”, which is the ratio between the number of players who are needed to be trained in order to produce one professional player. To apply the aforementioned system, all clubs are to be classified in one of four categories by the association with which they are affiliated, depending on the amount of money they invest in training and on the quality of the training offered to young players. The scale ranges from high-quality training academies down to amateur club centres. This categorisation must be reviewed on a yearly basis. 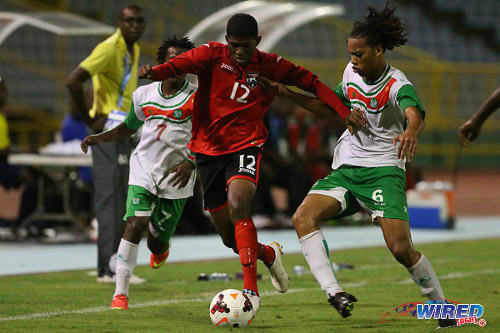 Gomez was one of five San Juan Jabloteh players who moved to W Connection during the off-season. Developmental fees were paid. The activity of every club that trains players is orientated towards giving the best training to the young players. Obviously, not all players will develop in the same way and in the same period. Some players will show their talent earlier, others later. Others may not be in a position to play at a higher level and will thus remain at a lower level of performance. Considering the social impact of football and in particular the possibility of giving all players equal opportunity, it is thus fair to consider the “player factor” whenever establishing the training compensation due for a particular player. In this way, the training club receives sufficient incentives so as to continue training players. Not all associations can allocate their affiliated clubs to four categories, as some associations may have only 2 or 3 categories at their disposal. Allocation occurs automatically for associations that only have category 4 clubs. The training costs as well as the categorisation of clubs are published on the FIFA website (www.FIFA.com). 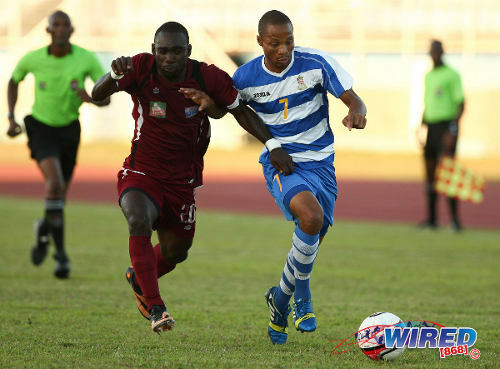 Photo: North East Stars striker Trevin Caesar (left) tries to burst past Defence Force attacker Balondemu Julius. 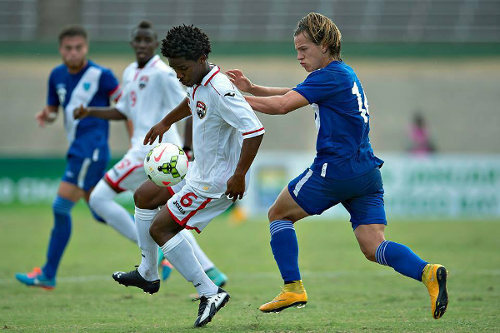 Caesar signed for US club San Antonio Scorpions earlier this year. Accordingly, the fi rst time a player registers as a Professional, the Training Compensation payable is calculated by taking the training costs of the New Club multiplied by the number of years of training in principle from the Season of the player‘s 12th birthday to the Season of his 21st birthday. In the case of subsequent transfers, Training Compensation is calculated based on the training costs of the New Club multiplied by the number of years of training with the Former Club. To ensure that Training Compensation for very young players is not set at unreasonably high levels, the training costs for players for the Seasons between their 12th and 15th birthday (i.e. four Seasons) shall be based on the training and education costs for category 4 clubs. 4. The Dispute Resolution Chamber may review disputes concerning the amount of Training Compensation payable and shall have discretion to adjust this amount if it is clearly disproportionate to the case under review. Corbin is due to leave for trials in Europe this week. Training compensation is based on the training and education costs of the association of the new club in order to encourage solidarity within the world of football. In this way, clubs are discouraged from hiring young players from clubs in other countries just because the training costs in these countries are lower. This means, in other words, that clubs that have the resources to sign players from abroad will be paying a foreign club according to the costs of its own country. Once the category of the new club and the training costs have been established, training compensation, which is due in a specific case, is calculated by multiplying the amount of the category of the new club by the number of years of training that the player received from the former training club(s). The training costs for players for the seasons between their 12th and 15th birthday (i.e. the first four seasons) are based on the training costs for category 4 clubs so as to avoid the compensation for very young players being set at an unfairly high level. The former club as well as the new club may ask the DRC to review disputes concerning the amount of training compensation (derived from the mathematical calculation) if they deem that this amount is clearly disproportionate to the case under review. “Disproportionate” means that the amount is clearly either too low or too high with respect to the effective training costs incurred in the specific case. The club alleging the disproportion in the amount of training compensation shall submit all necessary evidence substantiating the demand of review. 160 CAS 2004/A/560: a club claiming that the training compensation calculated on the basis of the indicative amounts is disproportionate bears the burden of proof. This club has to present concrete evidence in the form of documents such as invoices, costs of training centre, budgets, etc. Only economic aspects are relevant in this respect. Example 1: player A, born on 15 August 1986, was registered from 1 July 1996 until 30 June 2005 with club X in Argentina. On 1 July 2005, he signs his first employment contract with club Y, a category 2 club in Spain. The timeframe relevant for the calculation of the training compensation starts on 15 August 1998, when the player A turned 12. Player A left club X after having been trained there for seven relevant seasons. This is the period that club Y shall compensate to club X. The training costs to be taken into account are those of the new club. The fi rst four years of training, i.e. from 12 to 15 shall be based on the training costs of category 4 clubs. The training compensation due from club Y to club X is calculated as follows: [4 x EUR 10,000] + [3 x EUR 60,000] = EUR 220,000. Example 2: player B, born on 18 May 1984, was registered as an amateur from 1 July 1996 until 31 December 2001 with club X, a category 3 club in Morocco. On 1 January 2002, he registers as an amateur with club Y in Morocco. On 30 June 2005, he signs his first employment contract with club Z, a category 1 club in Germany. The timeframe to be taken into account starts on 1 July 1996, when player B was already 12. The fi rst season to be taken into account is thus the season of the player’s 13th birthday (cf. annex 4, art. 5 par. 2). Player B left club X after having been trained there for 5½ seasons. Player B left club Y after having been trained there for 3½ seasons. Club Z shall compensate club X for 5½ seasons and club Y for 3½ seasons. The training costs to be taken into account are those of the new club. The first three years of training, i.e. from the season of the player’s 13th birthday to the season of the player’s 15th birthday, shall be based on the training costs of category 4 clubs. The training compensation due is calculated as follows: for club X: [3 x EUR 10,000] + [2.5 x EUR 90,000] = EUR 255,000; for club Y: [3.5 x EUR 90,000] = EUR 315,000. 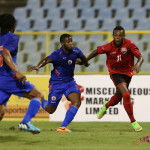 Photo: Trinidad and Tobago National Under-20 forward Nicholas Dillon goes for goal during the 2014 Under-20 Caribbean Cup. Knowledge is king. A lot of d big clubs in our country takes youths from other clubs, sells them and don’t even offer a ball to that club while laughing all d way to d bank. But for a lack of knowledge u will lose out on such incentives. Few, very few Teams maintained a Youth setup, and have records, Connection and Rangers are the only 2 I can think of presently. Sheldon, as I mentioned Civic does as well. So who gets the money when Trendsetter Hawks players reoresent Jabloteh at youth level before playing for Central then going to Honduras on a free? In theory, if Trendsetter Hawks have paperwork to show he trained with them then they can put forward a case. But if he plays in a TTFA competition for someone else that same year, then they could forget it. 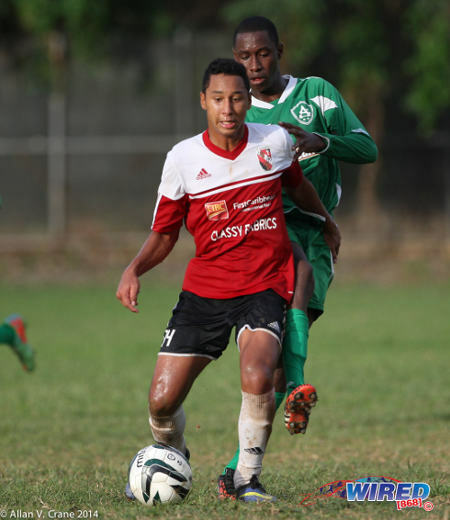 Jabloteh and Club Sando have youth setups too. I think the only TTFA recognised youth tournaments now are RBNYL and Youth Pro League. So clubs in those competitions can make the most convincing cases for training compensation. Schools don’t qualify either. So if Fatima or Trinity College East polish a player through their academies, it is still the club he plays for either competition that benefits if he ever turns pro. Yep Travis. You could probably still apply. But here is the funny thing, David John-Williams sits on the fifa committee that you would apply to. W Connection fully well knows that and could have advised you better. Hmm. Well he turns 24 in September I think. So just maybe. What’s Boatswain age? Where did he develop? He is 23. He spent two and a half years at Point Fortin Civic. I’m not sure about where he played his youth football. Schools are not recognised as clubs. So they don’t count. However since Boatswain is already 23, he doesn’t count. Hi all, is there any way to find out the categorization of a certain club, e.g. Hertha BSC Berlin? I heard about the FIFA TMS, but it is access-restricted. Thanks in advance. My guess would be that Hertha Berlin would be in Category II. But I believe that would have to be determined on a case by case basis. Don’t think there is or ever could be a hard and fast rule about the value of training at any club. It would change over time. An internship at Glasgow Rangers or Leeds United, for instance, probably isn’t what it used to be. Hi Lasana, thanks for your reply. Due to the fact that I need the data for a study, seems like I have to set up some assumptions 😉 Thanks again and have a nice weekend. I’m glad to see that T&T and other Caribbean nations are starting to recognize how Training Compensation works and can benefit them. Surely, there is a fair amount of money that is not making its way to deserving clubs, especially when players sign with clubs in the United States and Europe. 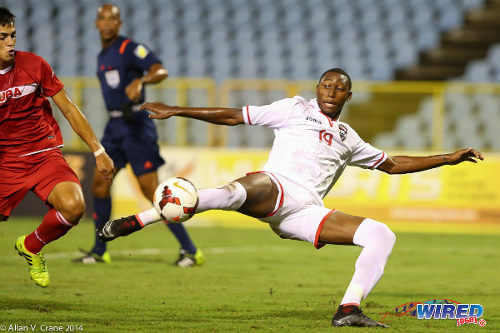 Here in the US, Major Leauge Soccer – where there are tons of Caribbean players whose clubs back home contributed financially to their development – refuses to pay or receiving Training Compensation. Their reasoning makes financial sense in that, based on the categories for each country, the US clubs would be paying far more money to other Western Hemisphere clubs than they would ever receive in return. Moreover, the US Soccer Federation also refuses to enforce Training Compensation within the United States. So it will be great when more foreign clubs put pressure on US Soccer to pay what it owes under FIFA regulations and is nevertheless unwilling to pay, not only to foreign clubs but also to thousands of smaller US clubs who routinely have their players stolen by our pro leagues without just compensation. This info has been around for a long time and even though local clubs would be given copies of it most times it is ignored. Joe Public and Jabloteh were the greatest culprits of this. There are numerous e.gs from as I could remember the mid 90s and up to recent years where this was not followed. Alvin Corneal complained a lot in the past about the practise. Also after much lobbying from Carib’s Sports club and the representing union, M’gmt of Carib took in Marvin Andrews ahead of many casual workers. He was somehow transferred to JP and spent I think 6 months there b4 he was transferred to Raith for £90,000. JP was the only beneficiary. Carib’s Sports club got nothing and subsequently complained to the Chairman of the company about what had transpired. Well it is said that this was one of the reasons former CEO (now deseaced)Tim N was terminated at the company. Arthlon, once you have your documented player passport, there can be no argument from pro clubs. If there is an issue, then why have you not spoken to TTFA who oversee all international transfers and organised football in T&T. But I feel that many of these clubs do not keep accurate records, or may not even meet basic developmental guidelines. Those that do, will receive funds, those that don’t need to shape up as it’s losing them money! Central F.C. are no angels. We’re not here to bless incompetence. We have yet to receive a single dollar in transfer fees, so we cannot pass any money to anyone. Yet we have helped clubs that supplied players to us. Finally, I posted this info. It is accessible to anybody. Problem is, nobody interested in acting professionally, yet call foul if someone else does. Well, clubs must have that paperwork ready for when players move on to Europe. I can understand Pro League clubs cannot afford to pay US$2,000 per year training compensation. But I think it fair that money should come out of the transfer fee when the player moves on to Europe. And US teams must be paid to comply. Enough of these free transfers to the US. Even if they can’t pay a transfer fee, they should at least follow FIFA guidelines and pay for the development of the player. After reading this, dada is owed alot of money am I right Travis Mulraine?